In recent years, automated X-Ray inspection (AXI) has grown as a new type technology. Similar to an optical inspection, an x-ray inspection produces images of the object. The image is then processed by image processing software that detects the position and size/ shape of expected features (for process optimization) or presence/ absence of unexpected/ unintended objects or features (for anomaly detection). Instead of visible light it uses x-rays (typically generated by an x-ray tube) that pass through the object. Opposite the x-ray emitter is a detector that either converts x-ray into visible light (creating an optical image which is then picked up by a camera) or sensor arrays that directly pick up the x-ray and convert it into an electronic image. The image is produced due to the different absorption of x-rays when passing through the object and can therefore reveal structures inside the object that are hidden from outside view. AXI, automated X-ray inspection systems are able to monitor a variety of aspects of a printed circuit board assembly production. It can not only check the solder joints that are under packages such as BGAs, CSPs and flip chips where the solder joints are hidden but also reveal many defects in solder joints that may not be visible with ordinary optical inspection equipment. They would normally be placed after the solder process to monitor defects in PCBs after leaving the soldering process. As one significant improvement in AXI, automated X-ray inspection, not only are 2D techniques available, but machines utilizing 3D technology are available and give significant improvements in performance. 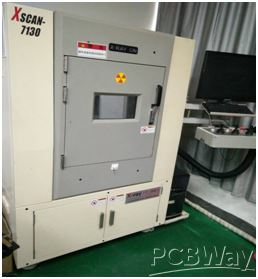 For 3D AXI equipment, PCBWay uses model Xscan-7130,it has high-efficiency Inspection system also it has secured the best stability and safety in the industry (amount of surface leakage less than 1μsv/h). In order to know the inspection coverage of AXI clearer, the table below as reference.